Dr. Moffet has studied philosophies of the most successful companies outside of dentistry and shares the best ideas learned there with his dental audiences. He has also studied with some of the most respected business and communications experts on the planet: Jim Rohn, Tom Hopkins, Zig Ziglar, Brian Tracy, John DiJulius and Tony Robbins to name a few. Dr. Moffet was an elected member of the Australian Dental Association New South Wales Branch Council and Executive. He is Past-President of The Hills Dental Study Group. He is a member of the Speaking Consulting Network and Directory of Dental Speakers. Editor and owner of www.edental. com.au – a website portal for Australian dentists – between 2001 and 2004, Dr. Moffet is published on www.edental.com.au and other dental industry publications. Cosmetic Surgery For Women. Plastic Surgeons. Melbourne. March 2017. Ultimate Patient Experience Full Day Workshop; Melbourne, April 2017. 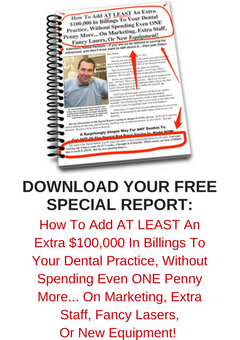 His book “How to Build The Dental Practice of Your Dreams [Without Killing Yourself! ] In less Than Sixty Days” is an Amazon Best-Seller. He has published articles on edental.com.au, dentaltown.com, and in Australian and North American dental print publications. He is the author of over 600 blog articles, published twice weekly at theUPE.com. Why Bring an Australian Dentist to Your Meeting? The Australian dental healthcare system is largely private insurance; patients are free to choose where they receive their dental care. (That’s all the more reason to get Customer Service right!) Dr. Moffet grew a small, two room dental office into a successfully producing, premier practice in a low-income suburb of Sydney, Australia. What was originally produced in a month, is now produced in a day. Dr. Moffet shares the protocols and success principles used to predicate and sustain this growth. Why is Dr. Moffet’s Approach So Successful Where Others Have Failed? Dr. Moffet incorporates the best ideas learned from studying philosophies of the most successful companies outside of dentistry. His business success stems from his belief that ‘dentistry is a people business’. Dr. Moffet’s presentations share the inside scoop on the unique systems his practice utilizes for exponential growth. Learn more about his most popular presentations below. Customized presentations are available upon request. Why is Dr. Moffet’s approach so successful where others have failed? Dr. Moffet has built his practice from the antithesis of traditional Dentistry: he’s looked at each and every aspect of the patients’ visits through their eyes only. Traditionally Dental Protocols have only ever considered the Dentist and the team. Dr Moffet has studied World Class Customer Service extensively outside of dentistry and implemented and integrated the best practices back into his office. This is not just any old customer service course. Dr. Moffet presents a systemized analysis of the Five Building Blocks of a patient/ dentist relationship. His simple system is easy to implement, with little or no cost and results can be seen immediately! Step outside of the box. Bring Dr. Moffet’s experience, enthusiasm and passion for the subject to your next meeting. How to convert more inquiries into New Patients (increase the ratio). Communication methodology for increasing appointment acceptance and reducing cancellations/ reschedules. How to make price irrelevant; ie, patients feel your prices are incredible value based on the experience they receive. Are your advertisements bringing in ‘tire kickers’… or quality new patients? In this thought provoking and insightful presentation, Dr. Moffet shares his top 5 lessons learned from 25 years growing and running a successful dental practice. This is not just another North American dentist talking about his local experience. Dr. Moffet shares his global perspective based upon his dental and business experiences both Australia and world-wide. These lessons learned both inside and outside of the dental field, when incorporated, will help you grow a stronger, more successful dental practice. How to identify and recognise the real reason for the patient to call. The best way to lead the patient away from their question about price. How to recognise that in most cases, most people are more concerned with value, rather than price. How to “romance” the caller into their necessary appointments.. Learn the three things NEVER to say to New Patient Enquiries. Learn which ads work best and where. Learn how to test and measure the effectiveness of all your advertisements. How to be ahead of the trend and why it’s important. Why it’s essential to look outside of dentistry to see what else is working. Participants will leave with ‘how-to’ ideas that can be implemented immediately.